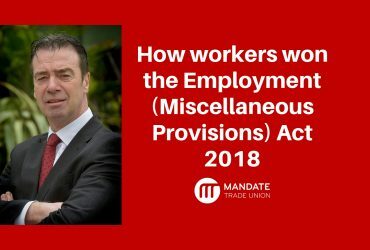 A conference of 300 Mandate Trade Union shop stewards from a range of different retail companies across the Republic of Ireland has today (Sunday, 17th April 2016) called for a union-wide response to attacks by Tesco Ireland on long serving staff members. Tesco is the largest private sector employer in Ireland with 14,500 staff in 149 stores. Management at the company are threatening to cut wages for staff employed before 1996 by up to 35pc on 16th May 2016. 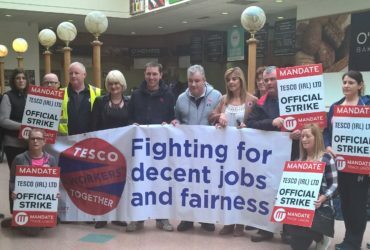 Irish Congress of Trade Unions (ICTU) General Secretary, Patricia King, who opened the conference, said the Tesco workers have the full support of the entire trade union movement on the island of Ireland as they fight to maintain decency and fairness in the workplace. 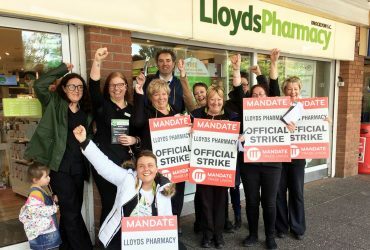 Mandate represent more than 12,500 workers in Tesco and more than 99pc of their 1,000 members effected by the cuts in Tesco voted in favour of industrial action last Friday, 15th April. The union is now conducting a second ballot of their 11,500 other members in support of the pre-96 staff.